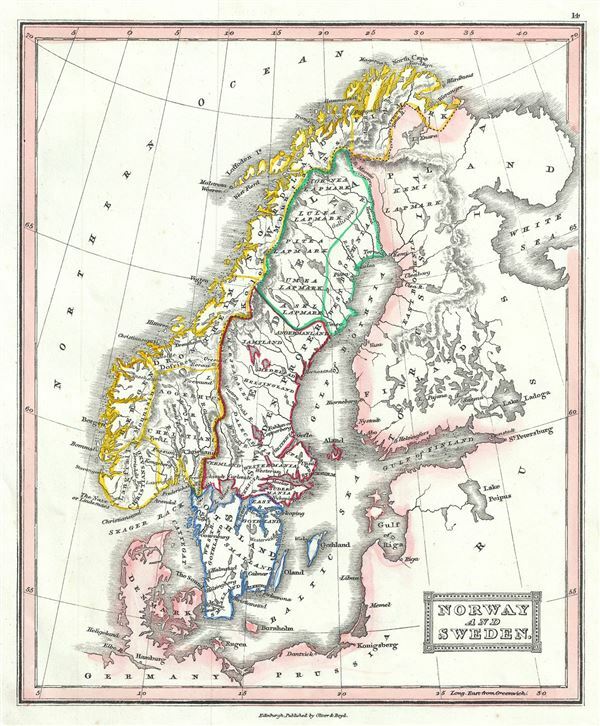 This is a lovely example of Thomas Ewing's 1845 map of Scandinavia, including Norway and Sweden. It covers from the Arctic south to the Baltic Sea and east as far as the Gulf of Finland. Throughout, the map identifies various cities, towns, rivers and an assortment of additional topographical details. Of particular interest is the Loffoden Maelstrom in northwestern Norway. This legendary whirlpool was the inspiration for Edgar Allen Poe's classic tale Descent into the Maelstrom. In reality, it is a periodic and powerful current caused by tidal variations in the region. At this time in history, Scandinavia was in the midst of a prolonged period of peace that led to a cultural and population boom, especially in Sweden. The economy however could not keep up with the increase in population and much of Sweden's population immigrated to the United States between 1850 and 1910.